Hi everyone. So my good friend is an artist who is trying to get into galleries and make it in the industry. She is most known for doing landscape portraits, flowers, country scenes, barns, fields, abstracts, etc and has never really ventured apart from that until now. I told her that a real challenge for her would be to draw a car, and she accepted. I showed her a few photos of mine and she went to town with it and put her own artistic rendering of the image so it doesn't just look like a photocopy of a car. It took her about a week and a half to do, but needless to say it came out amazing and I was very impressed. So if some members on here want this done, I could probably get her to do a few more of them. I don't know how much she would want per painting, but her prices on other works are very reasonable. The print size is 16x20, so these look fantastic in a frame on the wall. This is pretty much the ultimate indulgence for the Z owner who has it all, and I can't wait to get mine up! If at least a few people are interested, I can approach her about it and get more details. As far as materials used, it is on canvas with acrylic paint. She was able to mix colors to match mine perfectly, so I'm sure others will be no different. Be sure to hit me with some ideas on a price point too. I won't say what I paid for mine because I don't want to sway people one way or the other, but it was probably more than what these would be if a few people wanted them done at once. I understand that people aren't looking to spend a lot on luxuries such as artwork in this economy, but keep in mind that between the supplies and the amount of time these take, it won't be a 20 dollar deal. Disregard the poor blurry picture quality and odd angle, its a quick snap from my cell phone. The colors are deep, lines are crisp, and the proportions are correct (looks like the back is small from this angle). Car art is a difficult sell. Something about the work must be unique. Your friend joins the forum, and posts in the marketplace. eBay is also a potential outlet. hmm not impressed you say look at the detail on the front bumper. You can actually see the reflection of the background. If i had a more modified Z i would see how much this would coast. Something is a little off with the example picture, I cant put my finger on it. Well as of now its just an idea, nothing tangible at this point. I haven't even approached her about it just yet, but seeing if others in the community had any interest. She sells many of her other works through art websites and privately, I don't think she's needed to revert to ebay yet. That's the beauty of art....its subjective I'm sure you don't like many of the ones selling for $40-50k either, but that doesn't stop those from selling. In no way was I offended by your comment either so don't take this the wrong way, certain people will like certain works. Yea, the back looks smushed. I noticed that as soon as I uploaded the photo from my phone. Its a poor angle, but the painting is in a tight spot right now because I'm in the process of moving. Last edited by chrisjersey06; 03-15-2010 at 05:50 AM. the front wheel and the back REALLY bother me. other than that its pretty good. my girlfriend is drawing my Z for her portfolio, ill upload a pic when its done. The biggest mistake most traditional artists make is they dont take the time to become known on the web. First step is to take all their work, create an online portfolio and start going to art forums and other websites associated with traditional art. AT LEAST spend the $25/yr and get a flickr pro account. When it comes to doing a car no matter the medium theres no room for interpretation, its a car and its obvious the artist is trying to make a realistic version. My only crit is if they are going to paint it use reference from a 35mm camera and slightly exaggerate the larger curves of the car, dont skew the whole car. I dont want to burst his bubble but sadly I or anyone with photoshop can take a picture of any car into photoshop and in less then 1 minute get the same look. Using one of the 60 filters in the program, change the filter settings a little and get the same effect of a piece of traditional art. Last edited by zerafian; 03-15-2010 at 09:07 AM. Luciapwns can she take more pics from that angle? im not quite sold yet... to much blue id say. Front and back wheels are pretty bad. Also the slope of the back of the car isn't great either. 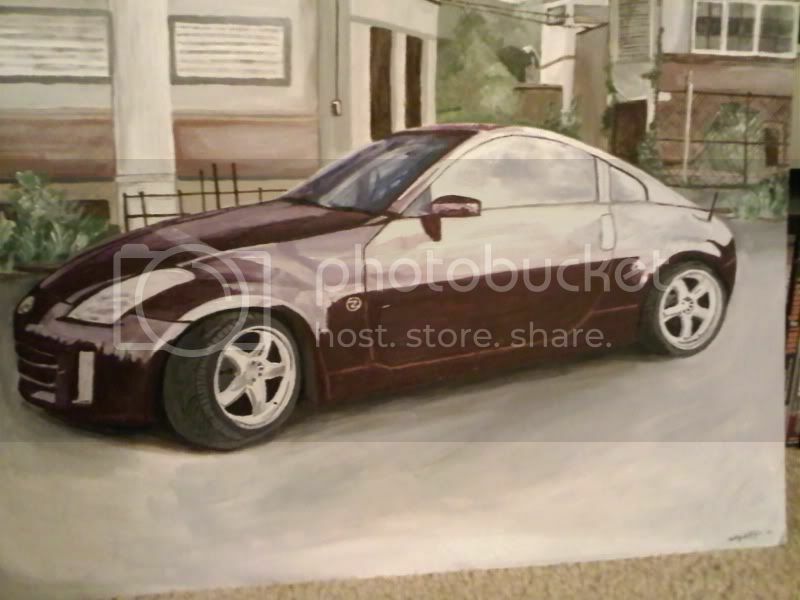 I'd be interested in looking at her other work, but wouldn't be interested in a pic of my car.